This elegant, etched mercury glass bowl sparkles with stars beneath beautiful Christmas roses, carnations and winter greens. 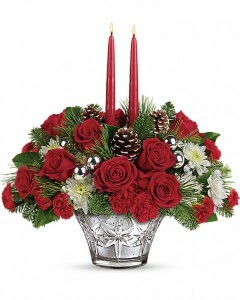 Complete with glowing candles, this magnificent arrangement shines as the centerpiece of any holiday table. Lush red roses, red miniature carnations and white cushion spray chrysanthemums are accented with noble fir, white pine, lemon leaf, and two red taper candles. Delivered in Teleflora's Silver And Joy Patterned Glass bowl. Don't show up to Christmas dinner empty handed! Charm your hostess, family and friends with this casual Christmas Tradition. **Please caall us for Single poinsettias, as stock changes daily in colors. $41.95 Triple poinsettia potted plant in Holiday Foil with Holiday Ribbon bow.// $25.95 2 plants with Holoday Foiled Pot, Holiday Ribbon bow **We will attempt to contact you (once,) if Red unavailable in size you selected. 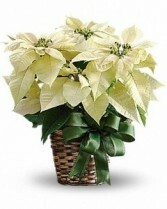 If unable to reach you at number provided, we will send the nicest pink or White poinsettia available. 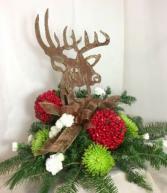 A woodsy flair this handsome bronzed deer adds to this large pine and flower arrangement! The bronze sparlkled ribbon shines and accents the Berry orb. Long lasting fresh Fuji & bright carnations at the Shown At price. 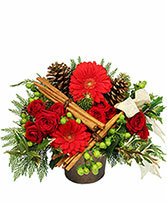 If ordered at$ 79.95, more fresh flowers and pine are added to enlarge. The $59.95 version eliminates one of the red-bittersweet berry balls, and Fuji in rear of arrangement OUR DELIVERY AREA ONLY - SEE ZIP CODES on bottom of home page.